- Premium soft scratchless applicator pad. - Perfect for spreading dressing and conditioner on exterior vinyl, rubber, and plastic parts. 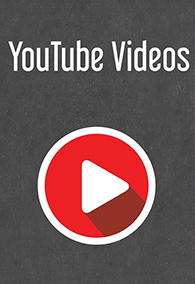 - Spreads the perfect thin, even layer of any product. - Works with water-based and oil-based dressings and tire shines. - Made with ultra soft 70/30 microfiber. - Durable plush foam core is easy to hold and spread product. The right tool for the job makes all the difference in the world. The Chemical Guys Black Workhorse Microfiber Applicator pad is the perfect pad for dressing and protecting tires, plastic trim, rubber weatherstripping, engine bays, and undercarriage parts. The premium pad is made with super soft 70/30 blend microfiber. This blend stays soft through dozens of wash and dry cycles, and resists scratches and swirls on sensitive automobile metal finishes. The thick foam core feels plush and firm in the hand and helps ensure even coverage while spreading tire shine or protectant dressings. Rubber tires, textured plastic trim, and bumper covers can easily fade and stain from UV sunlight, improper cleaning, and constant exposure to road grime and filth. Restore textured trimpieces and lay down a solid layer of vinyl, plastic, and rubber conditioner with the Black Workhorse Applicator Pad. Use the premium soft applicator to spread oil or water-based dressings on textured plastic, tires, and engine bay components. 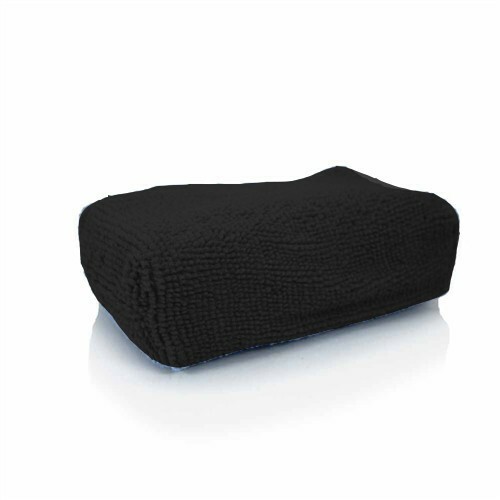 The premium black microfiber stays soft and supple and hides unsightly dirt and grease stains from repeated use on the filthiest areas of any vehicle. Choose the Black Workhorse Microfiber Applicator Pad to restore and protect exterior plastic, vinyl, and rubber trim pieces. Tire shine and protective dressings restore a deep-black look to exterior vinyl, rubber, and plastic parts, and helps prevent future damage and fading. UV sunlight, pollution, and improper cleaning products cause textured plastic and rubber trim to fade, turn chalky and white, and even degrade and crack. Regular maintenance with any oil or water-based Chemical Guys dressing helps keep black plastics and rubber pieces looking fresh and new. Spread VRP into tire sidewalls with the Black Workhorse Applicator Pad to make tires look clean and protected. Work Silk Shine into engine bay plastic panels and rubber hoses with the Black Workhorse Pad for a factory-fresh appearance. Restore a deep-black shine to textured plastic bumper covers and trim panels with New Look Trim Gel on the Black Workhorse Applicator. Using an applicator for paint or leather on tires and plastic can permanently stain them with thick grease and brake dust. Wiping other areas with these stained pads can then cause permanent swirl mark damage or stains set deep into the leather. Cross-contamination is an amateur mistake. Choose the Black Workhorse Microfiber Applicator Pad to make any vinyl, rubber, or plastic surface shine with your favorite Chemical Guys dressing. Cross-contamination between paintwork, wheels, leather, and glass can ruin a detail job in one swipe: grease from a tire can stain leather seats; wax from paintwork can streak glass; dressings and creams from plastic and leather can leave spots on paint. The Chemical Guys Workhorse Microfiber Line covers towels and applicator pads for every area of the automobile. 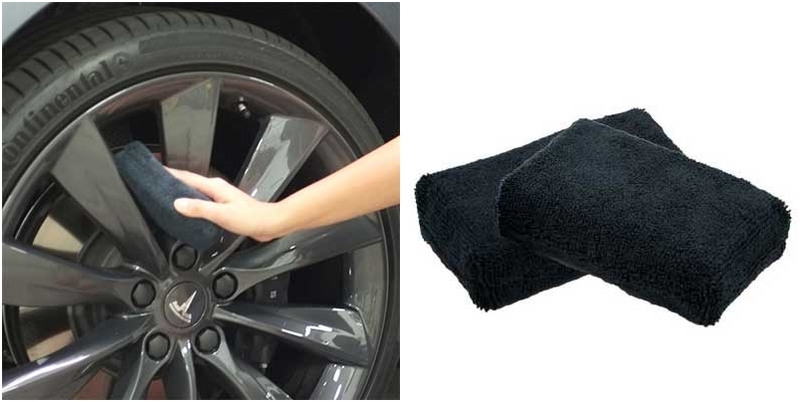 Use the premium microfiber towels to clean exterior and interiorvehicle areas, engine bays, wheels and tires, undercarriages, leather upholstery, metal parts, and more. Use the right towel for the right area, and avoid cross-contamination between sensitive leather and fabric interiors and greasy exterior surfaces. Now choose the right applicator pad for the corresponding area! Use Green Workhorse Applicators for exterior paintwork, plastic body panels, and carbon fiber trim pieces. The Yellow pad is perfect for dressing interior plastics and vinyl upholstery. Use blue applicators to coat and seal windows against water spots and contamination. Gray Workhorse Applicator Pads are perfect for coating metal parts like chrome bumpers, polished aluminum trim, and any type of painted or polished wheel. Choose Tan Workhorse Pads to spread premium leather creams on sensitive leather upholstery. Keep plastics and rubber pieces like bumper trim and tires deep black and shiny with the Black Workhorse Applicator Pad. Choose the right tool for the job with the Workhorse Lineup of towels and applicator pads. Separate microfiber items by type into designated wash & dry loads. Keep grimy towels and applicators separate from cleaner ones. Start by washing “cleaner” microfiber first, then finish with “grimier” items. Machine wash microfiber goods with Chemical Guys Microfiber Wash and HOT water Hot water opens the fibers to better release dirt and grease. Machine dry microfiber goods on LOW heat High heat cooks fibers, makes them hard, and then they can scratch paint.